World class quality and taste, locally grown in the Waikato. Located in Ohaupo in the heart of the Waikato, the team at Quality Mushrooms has been growing top quality mushrooms for thirty years. Although our family owned and operated farm has expanded and developed over that time, our focus on quality and innovation remains the same as it’s always been. There are many steps involved before our mushrooms arrive on the supermarket shelves. We believe that goodness in equals goodness out — that the mushrooms we grow are only as good as the compost they’re grown from. Making mushroom compost is a complex process that we’ve been perfecting for decades. All the mushrooms you see in the supermarket are grown indoors, all year round. To create the perfect environment for growth, we carefully monitor and control the conditions inside our growing houses to re-create the conditions of a typical autumn morning. We handpick all of our mushrooms, using a special one touch picking technique to keep the mushrooms in top condition. Mushrooms are placed directly into punnets and immediately cooled to lock in the freshness. 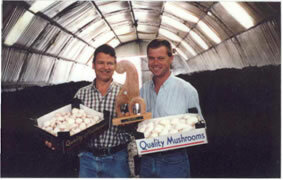 After harvesting, mushrooms are graded and packaged according to customer requirements. There are numerous in-process inspection and quality checks, carried out by our quality control professionals. All of these operations are carried out in a temperature-controlled environment to ensure maximum product freshness for the customer. We’re proud of our quality product, but there are always ways to improve. We are continually researching and implementing new strategies to improve every aspect of our production cycle, from composting through to packaging. Quality Mushrooms is proud to be a member of Kiwimushrooms, the mushroom growers federation of New Zealand. Check out our recommended mushroom recipes on the Kiwimushrooms Recipes page.